Nurse Lauren Barclay put her life on hold to keep a watchful eye on her troubled sister. It’s why she’s back in Houston. But that means confronting the brooding physician assistant who caused painful turmoil in her family—and left Lauren with memories her heart can’t forget. PA and single parent Elijah Landry is no stranger to stormy relationships, including one with his father, who is threatening him with a restraining order. It won’t stop Eli from protecting his disabled brother—or from making peace with Lauren. He wants that and so much more. But as Lauren and Eli draw closer, a powerful hurricane roars toward Houston. Survival instincts take priority and everything changes. Can hope weather the storm? This is the third book in a series, but the first one that I had read by this author. Honestly, I'm going to tell you right off the bat that while I liked the book, I wouldn't necessarily consider it chick lit or even romance. It's deeper than that. It's a complex story that held my attention right until the end and one that truly spoke of hope and how difficult it is to hold onto at times but how if you hold on, you'll find that the light at the end of the tunnel isn't necessarily an oncoming train. If you're looking for some light romance, then this might not be the book for you. 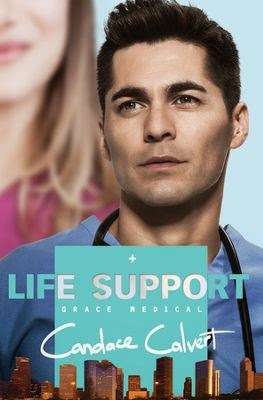 However, if you're looking for something a little deeper, I'd recommend picking up a copy of Life Support. This sounds like an interesting book. Thanks for your thoughts and the honest review. I have numerous giveaways going on at my site if you want to hop over and check them out. Have a great weekend!